In my previous post I showed how to enable MATLAB in Jupyter notebooks on Windows. Now it’s time for GNU/Linux (Ubuntu). My main issue with enabling new kernel was having initially installed two Anacondas and two Python versions (2.7 and 3.5). After a lot of frustration, I decided to remove both Anacondas and have a clear install of the latest Anaconda with Python 2.7 and 3.5. In this tutorial I assume that Jupyter and MATLAB are already installed on your system. The guidelines to managing Python environments are here. Now check whether you can actually run the notebook. Initially, when I tried using Python 3.5, I could see MATLAB among the options but the kernels would die each time I tried running the MATLAB code. Moving to Python 2.7, as described in this tutorial, solved the problem. Initially, I struggled a bit with making it all work so in the meantime I also tried installing Octave (a free equivalent of MATLAB). I’m not sure whether that installation helped me with running MATLAB within Jupyter. This was due to installing the Python engine in the wrong environment (i.e. my default Python 3.5). It was solved by activating Python 2.7 and using it to install the Python-MATLAB engine. 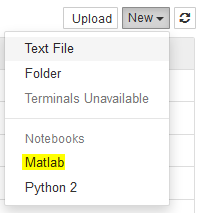 I think that there is an alternative way to activate MATLAB in Jupyter, without Anaconda, would be to explicitly point the installer to the Python version that supports the Py-MATLAB engine. You might also want install the engine in a non-default location. In that case, MATLAB has a solution to that problem and suggested installing Python in the home directory. There is another Jupyter kernel (imatlab) engine that supposedly works with Python 3.5 and MATLAB R2016b+ but I haven’t tested it myself. As long as my current configuration works, I’m not planning to go through the hell of installing dependencies again. This entry was posted in Tutorial and tagged Jupyter, Linux, MATLAB, Python. Bookmark the permalink.